That is my sister, Mary Ann, working the snow blower without much luck. Lone Pine, California. I said goodbye to Claiborne Mitchell who helped facilitate the California stretch as snow-covered Sierra Nevada’s reminded me, winter is coming, winter is coming. A strong westerly wind pushed us quickly across the Mohave Desert. I’d intended on traveling across Death Valley following the route I’d taken in 2007. But weather, time, and the fact I was pulling a horse trailer (plus nearly everyone said, don’t go across Death Valley with a trailer) had me reconsider. “Triple Farms” has been a repeat stop since 2007, on the 5000-mile ride with Honor. The owner, Suzanne Evans, and her partner Jake have had their hands in a dozen different adventures. This time it’s a produce stand! Incredibly successful and how pretty with an enormous selection. I wished I’d taken more of their produce with me when I left after a two-day stop over. Her daughter, Brittany Pennington, is a partner in this adventure. Next stop – Flagstaff, Arizona. Snow greeted me as I drove into Mary Williamson’s home who kindly hosted my stay. Like I said earlier, this has become a reunion book tour. 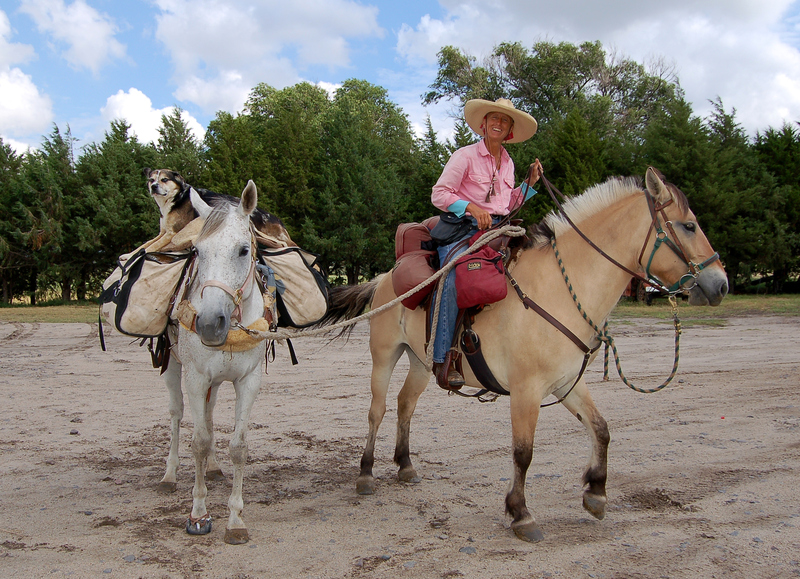 I stayed with Mary and her partner Chris Mcintosh in 2008 on my 3000-mile ride with Honor, Essie Pearl, and Claire Dog. Mary made all the arrangements for the Flagstaff talk which was standing room only, by the way. Mary & Chris in Flagstaff, AZ. Ran down to Prescott, Arizona for a talk, where Sharon Christopherson and Gary Hammond surprised me. I stayed with them back in 2007 and 2008! With Gary & Sharon in Prescott, AZ. St. Johns, Arizona. I met Kay McDevitt in 2008. She has been caretaker of the fairgrounds in St. Johns for I think she said, 27 years. From St. Johns I ran over to Holbrook for an evening talk before moving on to Silver City, New Mexico. Kay still moving from here to there with her dog and golf cart! Silver City, New Mexico was non-stop talks thanks to Pat Wolph who made all the arrangements AND hosted my stay in her pretty casita. We may have been busy but we had a great time and good turn-outs for the talks. Truth or Consequences, New Mexico. Grapes Gallery hosted my talk and Grace Bryan provided one of the loveliest settings in her colorful gallery that I have spoken at. More photos – Between Lone Pine, CA. to Truth or Consequences, NM. This young gal, her name was Jessie. She so reminded me of myself at her age. She took my tires off and replaced the valve stems. Not many gals could do this. A lovely article and the colors in the photo are beautiful! Interview at the Hat Ranch Gallery, Santa Fe, December 20, 2018, by Olivia Harlow, with the Santa Fe New Mexican. My old 69′ Ford crept up the steep long incline like a steady chug a chug train, 30 mph. An exquisite Ahhh came oozing from my lips expressing both the gallant work my little blue truck made but also at the view presented as I crested the top. Eastern Oregon from Pendleton to Prineville is big and windy and open. It pitches up and over giant rolling hills now brown from a dry summer. The roller-coaster road, newly paved, dark, smooth, shoulder less. “Keep to the middle if you can,” I say to myself with reservation at the drop off. Yet, beautiful as it is, it simply does not compare to the long slow climb on horseback or most often on foot as I lead the horses up giving them a much needed break. A hill like that I thought would have taken us at least 45 min to complete on horseback. With a truck and trailer 10 min. max. Time, lots of time that’s what equestrian travel takes and in that time the smallest details can be acquired. Smells are shoved up your nose – nearby cattle, exhaust fumes from cars and trucks, the horses sweat, road kill. I hear the steady sound of hoof beats or a red tail hawk shriek over head at the intruder down below. Maybe I am startled and jump because a rattlesnake shakes out a warning or a darting rabbit rushes by, both coming out of no where. The wind steals my hat, I tighten my stampede braid. The horses breath on my arm, my heart beats heavy in my chest and I lean a bit forward plodding one foot after another. All of this is lost in truck travel, even at the speed of 30 mph. All passes by much to quickly. So much can happen as I slowly but steadily climb to the top of yet another momentous hill on horseback. But it’s not a huge jump from Fjord to Ford they have many similarities when I think about it. Both or legendary, tough and built for the long haul. But so much will be missed as I roll along on smooth, paved surface – however necessary if I am to make my appointed times for slide-show presentations and book-signings. So it goes. Horse travel…20/30 miles a day, truck travel…200 miles a day. If you take the “j” out of Fjord you get Ford. My 1969 baby blue Ford has a rebuilt engine, front end, new brakes, bearings, seals, battery, tires, there’s more I just can’t remember what all the mechanics back home did to the truck. Thank you Wayne Bozarth, his son Tim and apprentice Jamie, from Eureka Auto for bringing the truck up to traveling speed. Like a champ, running like a champ gentlemen! Never without my Benchmark Maps giving me a clear route. My old Ford (which I refer to as “Bills Old Blue Truck,” was given to me by Bill Griffins widow. Bill and I were good friends for many years. The blue Ford spent its entire life,until now, running Bill and his old dog Whiskey, around the tiny community of Trego, Montana. Bill bought it new in 1969 in Kalispell, Montana. A fifty year old Ford is I am learning, a head turner. Not by the young so much, but by those fifty and older. “This was when they really made trucks.” said a man helping me at the Heppner Fairgrounds. “My Dad had one just like that, same color.” Came another remark at a gas station stop. An elderly man came over with his new Ford while I parked one afternoon, leaned out his window and said “Best damn truck Ford ever made,” I suggested we trade straight across for the 2017 white super duper Ford truck he was driving. It’s easy to romanticize, like equestrian long riding. But really, truth be told – the new trucks are quieter, faster, have more power, get better gas mileage, pollute less and are far, far easier to drive. The only thing not better is the price of a new truck. I think Bill paid something like $7000.00 for the 69′ Ford, new. And don’t think for one minute that I would not also be driving a new truck if I had such money, but I don’t. 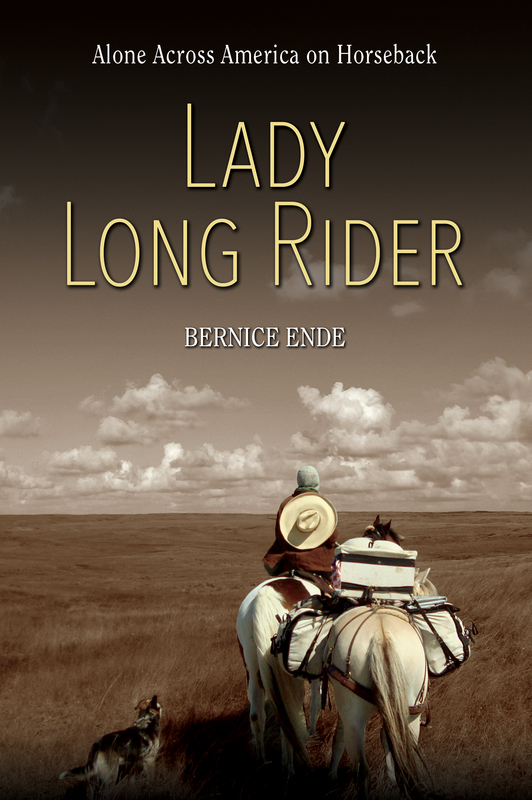 And so, here comes “The Lady Long Rider Book Tour Mobile,” just smile and wave. Weather is warmer here as I leave Pendleton, Oregon behind. Sunsets linger in shades of orange, pink and reds something I miss deeply at my Montana cabin where the sun sets behind mountains hiding the colors of sunrise and sunset. I feel like I’m climbing up and over the backs of giant brown dinosaurs. I forget how big this part of our country is, how “cowboy” it is. Steve & Audrey Ullakko long time friends from Naselle came to visit in Pendleton. Steve is a Ford Man and likes the sound of the old truck. Now two weeks into my book tour I’m beginning to realize like other long rides, that this will take more than I’d bargained for. I must pull tenacity and single-minded determination from my saddlebags. I must call to my will power, all the while reminding myself “don’t forget about the love and longing of the ride.” Remember it is not in getting there but rather all those singular steps required in making the journey. Our stop in Pendleton, Oregon included a visit with Rebecca Adams. Rebecca donated Liska Pearl to my rides last year and approved of Liska’s new life. I had once thought “Oh this is really just another long ride, a little different, true. My horses travel in a horse-trailer pulled by a 69 baby blue Ford pickup. But its not, its not at all like long riding. I am pulled in a dozen different directions at once, distracted by truck, by traffic and speed! Long riding is methodical, slow, deliberate. My hands are on horses, not machinery. Hat, blue sweater, wrist socks and feet socks by Jeanne Grace,. White tin cup by Rosie Rollin. thank you ladies. Before each of my rides I have said, “Its all a lot of talk until we actually do it.” That includes me and the truck. Happy Trails.